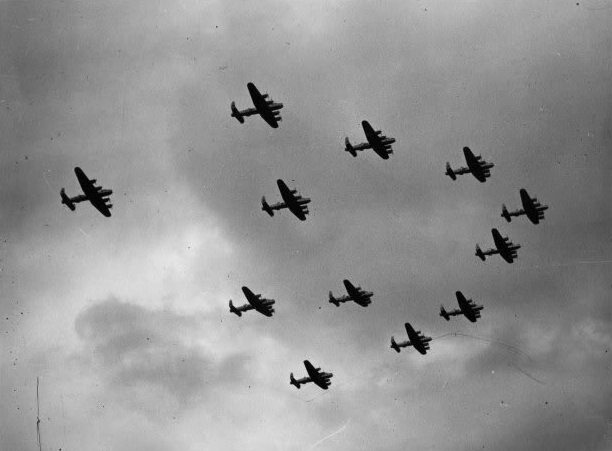 The Squadron left in full strength of 16 Aircraft (TL-O Oboe having finally arrived from Long Beach in time for the last leg of Departure) and arrived at Mitchel Field at 15.37 on the 18th August having finally flown in Formation over Worcester, Boston & Providence en route. On Arrival back at Mitchel Field, there were final opportunities for Sightseeing & Shopping, but from the 20th the Ground Crews were hard at work carrying out a full Service to Radar Gear & General Preparation for the return home. Air Chief Marshal Sir Alfred Guy Roland Garrod GBE KCB MC DFC then Permanent RAF Representative on the Military Staff Committee of the United Nations personally wrote on 15th August from the UN to congratulate Wing Commander Craig on the success of the Tour on anticipation of his Return Flight to Mitchel Field. He had witnessed directly their precision Formation Flying and the high standards of Discipline displayed at Long Beach Air Base, California. IWM Reel 2: Aircrew arriving at Aircraft (TL-H, TW878 F/O Timothy Lamb) and Taxi out. VIP visitors looking around Lancaster with 6th Ferrying Group of Long Beach, Sign on background building. Female Celebrity (Dorothy Lamour) signing Lancaster (SW313, TL-B – F/O Barker) and posing in front of B-29 “City of Spokane”. RAF Officers on a Sightseeing Trip, scenes at Barbecue. Lancasters in Formation air to air over Baltimore (Baltimore Brick Co. sign on Factory Roof). Flying over US Capitol Buildings, Washington, Crews on Parade in front of Aircraft. View of Senate House & White House, back to Aircrew & Groundcrews being inspected by RAF/ USAAF Officers & VIPs. Picnic scene with Crew eating & posing. Avro York being Serviced with C-47 & Lancasters on Apron. B-25 taxiing. Visitors (US Officers & Spouses) strolling around Aircraft on Display. Engine Service on Lancaster. Interior Shots of Officers Club. Shots of City Skyline & elevated view over Central Park, New York & Surrounding Streets. The Aircraft departed Mitchell Field on the 22nd for Gander where there was further Maintenance Work to be carried out. The famous No 35 Squadron – 16 RAF Lancasters + 1 Avro York – which has travelled 15,000 miles on a 6 week Goodwill Tour of America, was taking off from New York, where the Tour started on July 17 for its Return home this afternoon. The Bombers are due at St Mawgan, Cornwall on Monday. Reuter.